The perfect comfort food.. creamy..mushroomy.. chickeny.. spell check is going crazy so those must not be real words.. but they should be. This skillet is simple, baked chicken in a creamy sauce is something the whole family will love! 1. Preheat oven to 400 degrees F, season chicken thighs with salt and fresh cracked pepper. 2. Melt 2 Tablespoons butter in a large oven proof skillet over medium high heat. Place chicken thighs skin down once pan is hot and butter has melted and cook until golden brown 3-5 minutes per side, then set aside. 3. Melt 1 Tablespoon butter in the same skillet adding your mushrooms and garlic cook about 3- 5 minutes until browned and tender. Add in chicken broth, dried spices and salt and pepper. Add chicken back to skillet and pop in the oven about 25-35 minutes until your chicken is completely cooked through. 4. Once chicken is cooked remove from over and over low heat stir in heavy cream and Parmesan and simmer about 5 minutes. 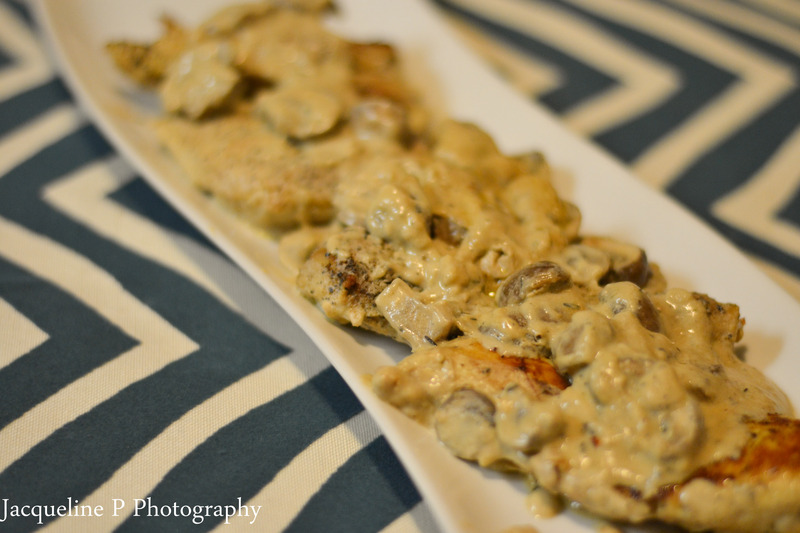 Serve chicken immediately, topped with mushroom cream sauce.